Here’s a new game app for the Kindle! ‘Timothy Parkers 30 Bible Crossword Games Volume 1: Easy (A Crossword Puzzle for Kindle)‘ by by Premier Digital Publishing is available on the Amazon Kindle site for $1.99! Just click here to download! 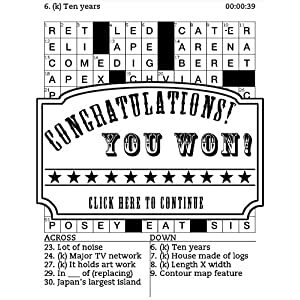 Timothy Parker’s 30 Bible Crossword Games Volume 1: Easy is great fun from the “World’s Most Syndicated Puzzle Creator”. These clever, hand-crafted puzzles give adult crossword solvers the chance to learn the Word of God and have fun at the same time. That’s the idea behind Tim Parker’s Bible Crosswords. Timothy Parker’s 30 Bible Crosswords app is built to enhance the typical puzzle experience and deliver hours of spiritual crossword fun. Scriptural clues lead to biblical answers in these professional, perfectly symmetrical puzzles which follow standard crossword rules. If you get stumped, reading the Bible is a perfectly acceptable reference book. Features include: Timothy Parker’s special scoring and ranking system, dynamic viewing of puzzle clues, auto-save puzzle progress, quick-start entry into your last unfinished puzzle, and lots more. Play this collection of puzzles, and enjoy both a puzzle and spiritual game experience. Remember that using a reference book when stumped, is not only acceptable but encouraged! Be sure to check out Amazon’s Popular Kindle Games & Active Content page for a review of the top games available! And if you want to see the apps as a bestseller list, check out the Bestsellers in Kindle Games & Active Content! NOOK Daily Find! Real Happiness: The Power of Meditation: A 28-Day Program by Sharon Salzberg for $2.99!! Looking for a Review of the Kindle Fire?